ANZ CEO Shayne Elliott finally admits documents they used in a court were "altered" (nice soft bank description for forgery) and gives an unreserved apology for 20 years of unconscionable misconduct. But then does not give any further explanation, or offer proper financial compensation and instead offers a small token gesture "goodwill payment." Requests to the ANZ Customer Advocate (case manager) Colin Neave for an explanation as to what is now going on, have been refused. TB was talked into putting up his house as part of the arrangement, while his business partner did not. When things went bad, the bank took him to court and sold up his house, while the partner did not have to pay anything and provided fraudulent bank documents to TB to say he was exempt. ANZ embarked on and deliberately concealed the forgery, including obtaining a knowingly fraudulent judgment. ANZ knowingly substituting forged documents and concealed the original documents from the court. ANZ falsely claimed the documents were subject to "Privilege." At least 10 criminal acts under the NSW Crimes Act were committed by the ANZ Bank! As well as breaches of legal Discovery/Disclosure and Privilege rules, that would void any judgement. Cost to TB's family was over a million dollars, and they were left $100K in debt and no assets. No ability to get justice via Police, ASIC, ACCC and the Courts were ineffectual. An attempt was made by lawyers Clayton Utz who contacted TB under the guise of taking on ANZ, but instead tried to use deceptive conduct to get their hands on the original ANZ document sent by the whistleblower, when in fact they were acting in secret for the ANZ Bank. The incestuous relationship between big banks, Politicians/Government and public bodies e.g. courts, ASIC, Police, ACCC). They do absolutely nothing, except make excuses, leaving victims powerless to get justice or protection from corporate criminal behaviour. LA - Tom, did you and your business partner sign up as co Guarantors for an ANZ loan? LA - When things went bad, did the bank take you to court and sell up your house, while your partner did not have to pay anything? LA - Did your business partner provide fraudulent Bank documents to you to say he was exempt? LA - How much did the whole thing cost you? TB - over a million dollars, leaving me in debt $100,000 with no assets. LA - Could you get justice via Police, ASIC, ACCC or the Courts? LA - 8 years later did you anonymously receive over 100 pages of original ANZ documents proving criminal behaviour by ANZ? LA - Do the documents prove ANZ criminally conspiracy to conceal the forging of a document by one of its bank managers? LA - Do the documents show ANZ deliberately concealed the forgery, including obtaining a knowingly fraudulent judgment? LA - Do the documents show ANZ concealed documents from your legal representatives and the Supreme Court of NSW? LA - Do the documents show at least 10 criminal acts under the NSW Crimes Act were committed by the ANZ Bank? LA - Do the documents show there were breaches of legal Discovery & Disclosure and Privilege rules, that would void any judgment? LA - Did lawyers Clayton Utz contact you saying they wanted to help you take on ANZ? LA - From your experience, how much corruption is in the financial system? TB - There is an incestuous relationship between big banks, lawyers, Politicians, Government, and public bodies. If this Royal Commission does not investigate how far the corruption goes, it will betray our country. In 2004 a whistleblower from within the ANZ bank sent me over 100 pages of the original ANZ bank documents, that ANZ had falsely claimed had been lost when required at Discovery/Disclosure prior to the original trial. Disclosure/ Discovery is supposed to take place within 28 days. ANZ avoided discovery for over 3 months and eventually poor quality photocopies were instead substituted for the original documents at Disclosure/Discovery and to the Supreme Court of NSW (to conceal the forgeries and altered documents). ANZ won its case against us based on what the original ANZ Bank documents now prove were forged documents and that the Judgment had clearly been obtained by Criminal Fraud. Further ANZ had concealed other crucial documents from my lawyers and the NSW Supreme Court, falsely claiming they were Privileged. Evidence reveals the forgeries were clearly done by the ANZ bank manager. After we had received the documents from the whistle-blower I contacted ANZ to bring to their attention the criminal fraud, and was shocked to be met with denials and legal threats. We then went to Channel Sevens Today Tonight program. This 7 minute video gives a very brief rundown of what ANZ did and how they did it. Note the hands of the bank manager Kevin Bugg, start shaking when he is shown the original document and he then changes his tune from nothing has been altered, to the document having been altered, but then claims he doesn't know by who. The evidence shows that the only person who could have altered the documents was the ANZ Bank manager Kevin Bugg. ANZ even disgustingly lied to me that Bugg had died. Channel 7 found him very much alive. Please also note the incredibly arrogant and nonsensical statement by ANZ (and the deleted scenes) at the end of the Channel 7 video. The statement by ANZ is clearly refuted by Justice Cole in his complete judgment and statements by the judge in the original trial. A few days after the Channel 7 story went to air, ANZ somehow had got hold of our unlisted home phone number (despite my moving interstate) and a man identifying himself as an ANZ Bank employee rang me at home one evening and physically threatened me and my family. He claimed he had been told to have "a word with me by the people upstairs." We reported the threats to (Channel 7 and) the NSW police. We also found out later that the lawyers for Channel 7 - Clayton Utz - had been covertly interfering with the editing of the 7 story, on behalf of ANZ. Further an attempt was made by lawyers Clayton Utz who contacted me under the guise of taking on ANZ, but instead tried to use deceptive conduct to get their hands on the original ANZ documents sent by the whistle blower, when in fact they were acting in secret collusion with the ANZ Bank. Clayton Utz is infamous for their behaviour in the McCabe cigarette case, where they told their client to shred or conceal documents from the court and I note they have come up again in the Royal Commission after altering a supposed "independent report" 25 times as directed by the AMP Board of Directors. Since 2004 multiple approaches have been made to ANZ including recently, and ANZ have consistently denied what happened in glaring defiance of the documents proving what ANZ did. I have a simple initial format of 24 documents and easy to follow description, that clearly prove what ANZ did. ANZ already has this materiel in its possession. Of course there are hundreds more documents, reports and forensic analysis, to cover every part of this appalling behaviour. The ANZ Bank embarked on a criminal conspiracy to conceal the forging of a document by its bank manager. ANZ deliberately concealed crucial documents from my lawyers and the court, confirming Collusion occurring between my former business partner and the ANZ bank manager. Senior ANZ bank officers embarked on a deliberate course of criminal Deceptive Conduct to conceal the Forgery, including making deliberate False Representations. ANZ deliberately concealed the original bank documents from my lawyers and the court and deceptively provided deliberate poor quality photocopy documents to conceal the forgery (refer Justice Cole's comments and Judgment). Documents subject to legal Discovery/Disclosure were deliberately and fraudulently concealed by the ANZ Bank falsely claiming the documents were subject to "Privilege", when in fact they weren't. The ANZ Bank manager committed perjury in his Sworn Affidavits and oral evidence. ANZ obtained a Court Judgment against myself and my ex wife by criminal fraud. At least 10 criminal acts under the NSW Crimes Act, were committed by the ANZ Bank! As well as breaches of legal Discovery/Disclosure and Privilege rules, that would void any Judgment. ANZ knowingly obtained a fraudulent judgment against my family, by concealing documents from my legal representatives and the Supreme Court of NSW and knowingly substituting forged and "altered" documents and illegally concealing the original documents from the NSW Supreme Court. The documents sent by the whistleblower further confirm the fact that ANZ had the original documents in its possession the whole time. The financial damage done to my family at the time of the deliberate fraud was well over a million dollars, with the loss of our unencumbered home, our business, huge legal costs and left $100,000 in debt. 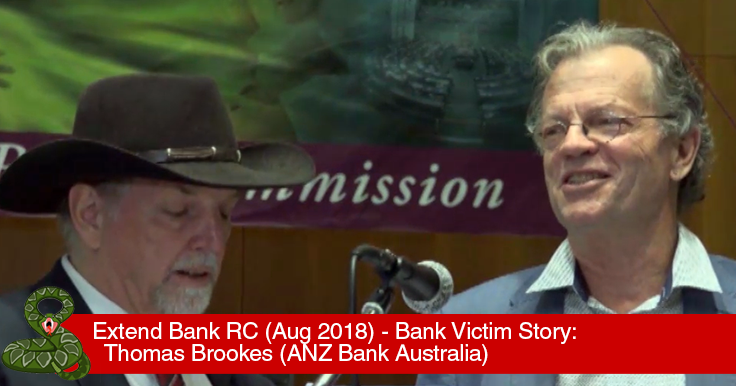 After contracting stress induced leukaemia and further threats from ANZ if we went to the media again, I gave up and have waited for the criminal behaviour by the banks to become a political issue. That has thankfully finally occurred with the Banking Royal Commission, which will be extended and its powers of investigation broadened to including what have become knows as legacy cases of bank misconduct. To date - since the criminal fraud by ANZ was exposed in 2004 - we have not received an apology nor a single cent in compensation from ANZ.